When anyone mentions Kishore Kumar today, one’s instant reaction is that he was a very famous comedian and then the second most popular reaction would be that he was a great singer. Must say, that is a lot to achieve in a single lifetime. But the truth is that is just the tip of the iceberg. Kishore Kumar was a lot more than that. Born in 1929 in a Brahmin family, no one had any idea that Kishore Kumar, born Abhas Kumar Ganguly, would ever become the mega star he grew to be. At the tender age of 19, he arrived in the city of dreams to try his luck. His brother Ashok was already an established film actor in Bombay. Naturally, Kishore Kumar too was nudged in the same direction. 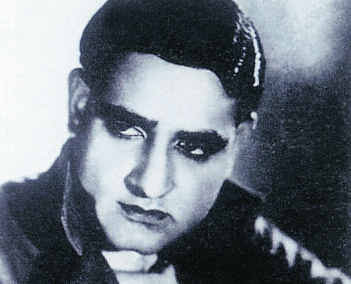 But what Kishore really wanted was to sing – he idolized Saigal Saab for his enchanting voice and tried to ape him. Though he had never received any training in singing, he went on to become one of the most famous singers the industry has ever seen. Trying something new and excelling in it came naturally to Kishore. Due to his second wife -Madhubala’s heart condition, his acting career took a slump for 9 crucial years. But he saw this as an opportunity and created some really deep and meaningful movies in the time available. As a film maker, Kishore’s style was vastly different from that of the jovial comedian that everyone saw. Being a realist to the core, his films were stark and naked – with a strong message and equally strong direction. Very to the point, it made quite a few people uncomfortable. He was labeled as an eccentric and his films were considered as not being commercially viable. But that’s exactly what they were not – he made those films not for main stream success, but for satisfaction. One of his productions titled Door Gagan Ki Chaaon Mein features him in the title role. The story is that of a soldier, who is anxious to get home after a long and strenuous war only to see that his home has been torched to the ground and the only survivor of this catastrophe is his son who is so badly traumatized that he can’t speak. The movie is about the unspoken bond that the two develop between each other – one which starts of as slow and halting, but gradually becomes the epitome of love and devotion. The film also stars his son Amit and the duo has doe such a beautiful job – it is moving and brings tears to your eyes. Then who can ever forget Chalti Ka Naam Gaadi – a light hearted comedy of errors which stars all the three brothers – Ashok, Kishore and Anup plus his second wife. In a hilarious and rib cracking comedy, Kishore has exhibited his versatility in direction – he showed everyone that he is not closed to anything. It is really sad that of the 18 films that he made, only eight saw the light of day and even those were grossly under rated. When it came to expressing himself through films, Kishore Kumar let a deeper, intellectual side of him be seen. Unfortunately, not too many could see that part of him as they were too busy laughing at his antics in other films. If they would have made that effort, they would have seen another facet to this gem of a man. This entry was posted on Monday, May 28th, 2007 at 6:27 pm	and is filed under Kishore diary. You can follow any responses to this entry through the RSS 2.0 feed. You can skip to the end and leave a response. Pinging is currently not allowed. @Arghyaji: Very few people have the guts to admit that their fav singers voice became coarser in their fifties, which is only too natural. One can’t just deny that, and its against evolution. Not just KK or Rafi, its true for one and all. Wether its SPb, Jagjit SIngh, Lata Mangeshkar, Bhimsen Joshi, its only correct that they won’t sound as nice in 50’s as in their pro-fifties. The same Rafi would have done much better with “Kya huwa tera wada” if he had sung at the time of “khoya khoya chand” and vice versa. Regarding national awards, I would just like to say that they are better than filmfare awards. and in that sense, I still rate them in a better way than most others. Post 76 there was no way KKji would have got National Award with Congress at the centre is only political, and anybody would have to agree here. Having said this I would honestly say that he should have got one before that, say for those Mili songs on Amitabh, or any of those Hrishikesh Mukherjee songs. Moreover, I was expecting some in Bengali. Thats what I always have in mind when I say about KKji not getting the award. Every singers’ voice changes with age and once they cross 50, it’s usually for the worse. KK’s voice, from a puritan’s perspective got coarser and consequently worse as he advanced in years. But I, like most of the KK fans, think that the voice got better and better. The ‘coarseness’ is very much the part of package that KK was and for most of the fans, the coarser it is, the better. To say KK is less appealing for a coarser voice is like saying that Salman is less appealing for a bigger bicep. I am not sure what you intended to say here.. As far as I am concerned, I made it very clear that Kishore Kumar’s voice “did become coarse” after his heart attack.. That is a fact.. I have mailed you two Rabindrasangeets of KK.. Thank you so much.. I want to ask you sir arghya why you try to compare Mohd Rafi with KK!!! !I don’t know anything about music but what said by greatest name in music world about Mohd Rafi and Lata Ji never said for any singer in Bollywood or any place in world…..as you know media played big role in 1970’s to put Kk at the top as they played a big role to put Amithab Bachchan down in 1990’s. KK was a great singer and will be but no one can be compare with Mohd Rafi. Sir arghya If am not wrong ask any Pakistani do you have better singer than Mohd Rafi the answer will be no…. I don’t know if you agree or not that RD Burman best film as music hit was when he used Mohd Rafi in all songs that was one of few films that one singer in all songs of film.. If we speak about best 3 singers ever born in Bollywood if am not wrong KK fans will put Mohd Rafi within three name……….I hope you understand what I mean……. when said that Kk was at the top in 1970’s because sung more than Mohd Rafi I think your are wrong as you know singing more numbers of songs not make better singer as you said that in 1980 mohd Rafi sung more than KK as you know mohd Rafi in 1980 he sung only for 8 months I feel that was a message of God to us that we don’t need good people with us..
it has been come from a deep observation that kishore’s voice was best in 70swhich later lost its deep bass and rythmic feelings in 80s also the indian cinema was at loss of good music director at 80s. being a die hard kishore fan one can feel that kishore was lonely in 80s being void of competition after death of md rafi. however what kishore had done to indian music is really uncompareable and none other than kishore could do it. 3. Similalry, please listen the numbrs of the other films mentioned by me, you will find justification to my statement,,,, Feel free to share your feedback also,,, but don’t use the word “popularity” for Teesri Manzil… Rafi fanatics(not fans), use this word very politically, when Rafi is compared with Kisghore, they say , popularity is not a measure and it is all of media game but when the same Rafi is compared with Manna De, they say “who is more popular? Rafi or Manna”???? ” So,, please, sir, get out of that and stick to musicial discussions…. Rds best music was amarprem. His best light music was not teesari manzil but “awanidiwani” where there were many experiments. his best composed song was “aanewala pal”. he did not like spb as he did not use him in “sanam teri kasam”. i would like to know about the interview where he said “rafi version was better than ishore” for tum bin u kahan. It is very clear that kishore version was appreciated and even rdb always said that kishore gave him extra dge. yes rdb was very careful. he never gave way to make impression that he discared rfi. he always periodically used rafi partly as he knew his competitiors lp peferd rafi, partly to avoid monotony, partly to get supprt from rafi fans. but a careful listening one come to conclusion that is favortie was “kishore” and like a clever fox he used ri or spb for a change and also to avoid the charges of being biasedness. he also knew what appened to mds who used only 1 singer “c. ramchandra, opn, naushad, and rdb wanted to play a long innings. 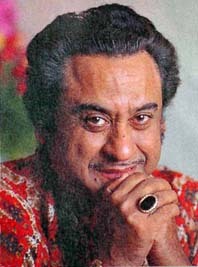 Kishore Kumar is my absolute favourite and i sing his songs profesionally too. He was a rare talent —maybe the most talented singer ever born or will ever be born. I am extremely happy to find this website. I create music on advanced synthesizers/ keyboards and love singing Kishore songs even for myself. Apart from him i love singing Neil Diamond and Engelbert Humperdinck who are my English favourites. I wonder if there is a music club in Delhi with similar taste and interest for music. the man re tu kahe na dhir dhare rendition of kishore as a tribute to rafi in khanadawa is beautiful and has more depth and conveys the mood than the original. kishore also sang it in filmfare. does some body have a recorded version of it. i dont think kishore’s voice became coarser in mid eighties. it was that just tunes were not good. mds like bappi failed to control him. listen to “maine timse kuch nahi manga ” from katha and nowhere there is coarseness. similalry mr india (1987) has no shades of coarseness! When did yesudas become SPB’s favourite singer, In your dreams perhaps ? I have seen in many interviews and heard from many people, only rafi in hindi and ghantasala in telugu are the favourite singers of spb. In fact, I have personally seen mentioning that SPB had quoted, his favourite singers are in line ghantasala, kishore, lata, rafi in order in one interview. Yesudas is a great singer from malayalam, but he cannot be placed anywhere near rafi in terms of melodious voice and expression range of mohd. rafi. Further, I have myself seen articles by Yesudas himself claiming mohd rafi as the king and similarly in the south, such reverence is only enjoyed by ghantasala of telugu, (even yesudas and illayaraja mention that) who continues to enjoy vast reverence even from rafi fans and fans of other singers as well even today i.e after nearly 4 decades of his passing away. I read ur blog….was interesting…. There are two ways to judge a singer: one based on technical (classical) aspects and one on feelings. No doubt, rafisaab had a much stronger classical base, as reflected in the vast variety of classical, qawali’ and bhajans sang by him. But when it comes to expressions, feelings, voice modulation (according to mood of songs) give it to Kishoreda. This is the simple reason, whenever anyone sings a kishoreda song (even if its reasonably straightforward in terms of sur) he is never able to match the feelings, expressions and voice quality of kishoreda. Whereas, when singers sing rafi numbers, they are able to come close to rafisaab to a greater degree than kishore-clones. While, rafi was more versatile in terms of genre of songs he did (filmy, romantic, classical, qawali, bhajans), Kishore gains the edge when versatlity in terms of moods of songs (romantic, sad, fun & dance numbers etc) is considered.Kishoreda was able to catch the mood of the songs perfectly through unmatcheable expressions and voice quality, above all – the voice throw, unmatched by any singer. Even after having talked about throw, I would still consider Kishoreda’s sad songs to be his best take for eg Chingari koi bhadke, O saathi re, Hum bewafa…the list is endless. While, in fun songs it goes without saying, he was the champion. The seriousness (yet surety) in “Meri Bheegi Bheegi si”, the romance in “Sagar jaisi ankhon waali, the expressions in “Hamein aur jeene ki chahat na hoti”, The voice throw in “Dilbar mere”, “Ek hasina thi” are unmatcheable. Having said that, I am also an ardent fan of rafisaab, consider his voice as sweet and silky smooth and admire his great strength in classical music. We miss these 2 legends of the past. dear arghya i really apreciate your words from your earlier post in which you said about popularity of Kishoreda over rafi or rafi over manna dey sahab,and the stupid mentality of binu niar and monty etc rafi fans.K.K’s songs is immortal and who thought this about rafi songs are totally wrong because (rafi ko is time generation hi boring kehti hai to aage kya hoga). If Kishore Daa is a complete garden of singing than Mohd. Rafi is simply an small flower of that garden. Mohd. Rafi voice looks good only in one occasion when he sings songs in gali or mohalla in an small Mehfil with Dhaplaa & Manjira. Whereas Kishore Daa was enriched with all the trades of singing and his voice was fit to all the legendary hero of different time but in other words because of his “Khanakti Aawaz Ka Jaadu” he made the Bollywood heros legend. The loss of Kishore Daa is the total loss of music world. Bandar kya jane adrak ka swad. How great she is, everyone knows. She herself is un-matchable, no one has come close to lata, yet she truly appreciates Rafi like this!!! If I had heard the interview given by SPB correctly, he had placed Rafi above all singers. Please go through that interview(given to a lady interviewer). In which he says how desperate he was to see Rafi once in a studio, how he touched his feet but could not talk to him etc etc..! He says how Rafi marveled him with his magical voice, range etc. Salaamat rahe dostana hamara and yaadon ki barat – kishore has excelled against rafi. Many such instances can be cited for kishore’s supremacy in bollywood singing. Regarding national awards, they were started in late 60’s and gained prominence only in 70’s. So as somebody says here, it is not correct to say that yesudas and spb got more national awards than others. As spb, yesudas etc. were established singers in 70’s and 80’s it is natural they got it. If the national awards were there in the 50’s and 60’s rafi from hindi and ghantasala from the south would have bagged many national awards without any doubt, more than k j yesudas and spb. Regarding kishore getting awards, already someone explained it was mainly due to politics. everybody is good in their own ways. although so many criticise kumar sanu, dont forget some of the good melodies he rendered. Please do some home work on the huge variety of songs that Rafi sahab had rendered from late 40s to middle 70s, before you would call him a ‘small flower’ in an ‘unknown garden of the best songs’ for you created in Hindi movies during this period!! Well guys, there hasenot been a voice greater than yesudas. You just have to stop being biased and listen to his hindi songs. you say Rafi , and i maintain that not even Great kl saigal can come close to yesudas , in voice, style , range , ability, singing octaves, pitch, and much more. This is coming from some one who doesnt even know tamil or malayalam , and all my life i have been thinking kl saigal was greatest singer india produced , well i was wrong. The Rafi-Kishore comparisons have been burning for years but on pure technical terms of richness of voice (which is what cinema playback singing is all about), I give the verdict in favor of Kishore, just a notch higher than Rafi. While it is unfair to compare these two totally different style of legendary singing talents, my vote for Kishoreda is based purely on rarity. For example, when you value a diamond based on 4Cs, the pure colorless diamond is the most expensive. Not because it is of any great quality as compared to a colorful diamond but purely because of the fact that it is extremely rare! So is our Kishore Kumar. There could be a singer as good as Rafi in singing talent but the voice of Kishore Kumar is extremely rare. In fact purists have said that the greatest of imitators could match him on very few notes and the music directors have struggled to compose tunes on those very notes to make the imitator sound like Kishore! These comments were made by none other than Lataji. Ashaji said that there can never be a voice even remotely as close to Kishoreda’s. Even past his prime, Bappida summarized it as a Lion of a voice and made other contemporary singers of the time look very ordinary. If a past prime aged Kishore’s voice could engulf an extremely talented SPB’s voice in Saagar you can imagine the fate of singers with Kishore in prime. Such was the affect of his voice that after his death there was a huge void and people were longing to hear his voice and could not digest the voice of other singers. As the immensely talented Sonu Nigam has once said in an interview that the imitator bunch ruled the roost for nearly a decade and people of Kishore’s era were not willing to listen to other talents while he was imitating Rafi in his early singing years. And yes, Rafi was extremely great talent playback singing has ever seen but his voice was not missed for such a long time by the people as they did with Kishore’s. kishore might have been a good comedian and actor or a good director but as far as singing is concerned, rafi sahaab is the greatest. where did yesudas come from he is not even that versatile. he is just a beast at classical music but thats it. kishore is better than yesudas and rafi sahaab is the greatest of the all! One can understand why the debate between these two singer continues. But with the passage of time, it is becoming increasingly clear (specially with the help of youtue), that Md Rafi is far ahead of kishoreji. simply because his timbre is more musical & heavenly than kishore kumer. Recently in Hindusthan Times Lataji has commented Md Rafi should be regarded as he greatest male singing voice of India, no singer can reach the higher octave pitch like him. And how could Bappiji say that the lion-like voice of Kishoreji suppressed all other voices in the 70? Then how would we explain the reality when in the 50s and specially 60s,all male voices virtually became insignificant and outclassed beside Md Rafi sahab’s gargantuan presence in those days? Except C. Ramchandra and to some extent Salil chowdhury, no music director could think of playback singing without him? ( particularly, from 1957 to 1970). Great singers like Lataji, Manna Dey, Mahendra kapoor and Mukesh hailed Md Rafi to be the greatest playback singer of India, ever I mentioned Mukeshji because, his son Neteen revealed in a Md Rafi programme recently that his father wanted Neten follow Md Rafai sahab and not him. The days Sanu Nigaam, Udit and Sreya Ghosal prefers Md Rafi over all male singers. Manna dey revered him along with Lata to be two singing institutions in India, which was published in ABP, WB recently. And lastly in the youtube era one can listen to both Kishore and Md Rafi back to back and easily decide who is great. Many musical experts do think that Md Rafi on umpteen no of occasions surpassed even divine Lataji in his timbre quality, which Lataji even conceded in an article last year. I would urge upon kishore fans to pause and ponder further before putting Kishore kumar ahead of Md Rafi! Some great classical sigers of bengal even hold Md Rafi far above Kishore kumar, who did have a tremendous voice, but in the final reckoning lacked the divine resplendence and awesome out of the world melody of Md Rafi, not to mention his classical single ability, which ruefully Kishore kumar lacked, but he too undoubtedly was a great singer too. Well if your idols had tried singing in any of the south languages then would have been a good comparison. Truth is yesudas voice is divine, and he has fans all around the world even in west who regard him as the best voice ever being heard. As far as rafi or kishore goes , kl saigal was wsy better comparatively. But ordinary north indians will never accept .reminds me of incident when kishore threatened yesudas for the same reason. @arghya Totally wrong observation about the high note – mein ne dil liya song. He was meant to start at a higher note!!! Rafi is undisputed king of singing world.No length of debate writing etc in favour of any other singer would lower the position of Rafi saheb .He was He is and He will remain the greatest singer of all times. I DO NOT LIKE TO SEE DEFAMING ANY LEGENDS BROTHERS… YOU ARE UNDERESTIMATING YESUDAS , SIR HE IS NOT BEHIND TO RAFISAB IN RANGE, HIS VOICE QUALITY ALSO NOT BEHIND TO RAFI SAB . AND ALSO LISTEN SUNAINA , THE SWEETNESS OF HIS VOICE, THE MELODY IN HIS VOICE..
« Kishore the singer – King of all trades..